Let yourself be immersed in style by wearing casual short sleeve walking suits made by Montique. You'll find the fabric that Montique makes are a step above the rest because all of their walking suits are made of fancy poly fabric that has a very fine touch and feel. 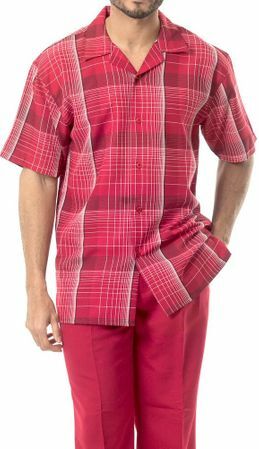 This short sleeve set features a bold plaid pattern in an open collar top and has pleated pants.